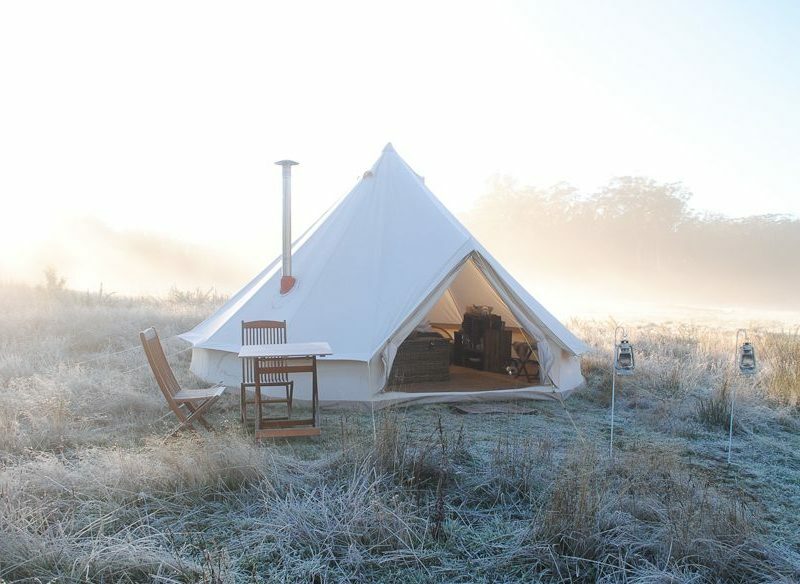 Cosy Tents nestled in the rarefied bushland surroundings of Daylesford. Five unique glamping (that’s glamorous camping) stays in Victoria where a bottle Bollinger or a boiling billy is equally on the cards. If you’re looking to go glamping in Victoria, you’ve come to the right place. From wilderness retreats and zoo safaris to seaside valleys, here we give you the top locations for glamping in Victoria. Nestled in the hills of the Hepburn Shire, in a wide, open paddock encircled by Australian bush and a dam, the five ‘Cosy Tents’ for hire here are just too cute for words. Linen of 1200 threads, duck-down quilts, wood-fired stoves, mood-setting lanterns and Bose Bluetooth speakers to play a bit of Paul Kelly: they’ve thought of everything. Except who you’re going to bring. From $185 a night. Pebble Point glamping, a suitable night’s accommodation on the Great Ocean Walk. Doing the Great Ocean Walk? (You should, it’s spectacular… just saying.) At the end, just three kilometres from the Twelve Apostles, in between three national parks, you’ll find this hidden bush retreat with five luxury tents. Each tent at Pebble Point has all the glamping ‘usuals’ – king-sized beds, spacious ensuites with full-sized shower and toilet, and a private deck with stretching views of the peaceful valley – as well as a shared lounge/dining tent, with fridge, microwave, toaster and tea/coffee facilities to refuel and get out exploring again. From $140 a night. Wilderness Retreats glamping, Wilsons Promontory National Park – So much more than your usual ‘two-minute noodle’ camping trips. Spend a day walking through rainforest, snorkelling at Norman Bay, or swimming in the azure waters of Squeaky Beach, then come back to your safari-style tent and be lulled to sleep by the sounds of the boundless nature in Wilsons Promontory National Park. In with the animals, Slumber Safari, Werribee Open Range Zoo. For little people, sleeping at Werribee Open Range Zoo just might be the best thing since sliced fairy bread – but this one’s for big people, too. The zoo’s ‘Slumber Safari’ package includes zoo entry for two days, exclusive wildlife viewings and an overnight experience in one of eight family-sized tents. Enjoy a sunset drink on your deck overlooking the ‘savannah’, feast on African-inspired cuisine then head out on a night walk and toast marshmallows on the fire. $300 per adult, $145 per child. Meet your giraffe neighbours at ‘Slumber Safari’, Werribee Open Range Zoo. Happy Glamper at Mornington Peninsula hires fitted-out yurt-style tents and, luckily, does all the hard work for you. Want a bit more flexibility with your location? Happy Glamper is your company: they hire out bell tents and yurt-style tents with beds, fresh linen, rugs, lighting and any other homey essentials you may need, to be set up at your chosen seaside location in the sparkling Mornington Peninsula. We know what you’re thinking: setting up your own tent isn’t very glamporous, is it? Don’t worry, they do all the work for you. They’ll even tow a vintage Airstream to your chosen site if that’s more your style. From $290 for two nights plus site fees. Happy Glamper’s ‘Lotus Belle’ interior – this one suits a family of five. If it’s views of a pristine sand and beaches you seek, rest your head at Phillip Island Glamping. With three sites on offer (each as breathtaking as the next), you really will be spoiled for choice. Fall asleep to sounds of the ocean and wake up just steps from the sand. You will also be right in the thick of all island activities, including the Penguin Parade and the Cowes Farmer’s Market. Equipped with a Queen size air mattress, heaters, crockery and card games, these tents come with the 5-star treatment you deserve. The glamping concept from Into the Woods involves picking the luxury tent that suits (all are decorated in a cosy Scandi style) then choosing between campsites at Yackandandah Holiday Park and Discovery Parks Lake Hume, both in the Albury-Wodonga region. Or for something different, Into the Woods will bring glamping to you, setting up camp on your property. If you’re keen to truly go off-grid, what could be better than a glamping island adventure? A short ferry ride from Stony Point on the Mornington Peninsula lives French Island National Park – the state’s largest coastal island. You’ll feel completely removed from crowds, truly immersing yourself in the famous natural landscape. We had a fantastic stay with Twilight Glamping, on the great ocean road. The owners Beth Brown couldn’t do enough for us, the bell tent was immaculate and cosy with everything we needed, all we had to do was turn up, after 2 glorious days we felt fully relaxed. I would definitely recommend Twitter Glamping, just tell them where you want to stay and they will provide everything for you, with different packages to suit. Will definitely be using them again.